I recently posted an article about Democrat San Antonio Mayor Julian Castro bashing Conservative Texas LT Governor Candidate Dan Patrick. I called the attack against Patrick a badge of honor because anytime a conservative is attacked publicly by a liberal then it means the conservative is doing something good! It really means you are doing something for the conservative cause because Castro is a national Democrat star and a friend of Obama. 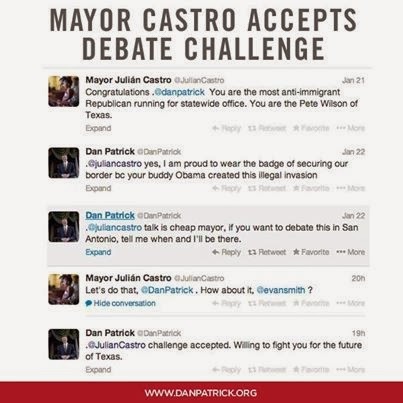 Well, after this little episode, Dan Patrick challenged Julian Castro to a debate. Patrick told Castro that talk is cheap and that he will go to San Antonio any day or time to debate the issue of illegal immigration. This could be epic! Dan Patrick is a staunch conservative. 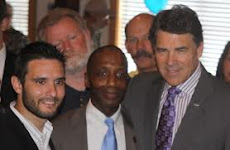 Patrick is one of the most conservative State Senators and is known for being very outspoken. Castro is also the same way, except instead of being an outspoken conservative star, Castro is an outspoken Liberal star. Well, the great news is that Julian Castro accepted! There is not date or time set yes, but I will post the date and time when it becomes available. Earlier this week Mayor Julia Castro personally tweeted me accusing me of being the most anti-immigrant candidate running for Lt Governor. I responded that I would come to San Antonio anytime to debate this issue. Last night he tweeted he would debate me and I responded that I was ready for fight for the future of Texas. We are working now to set the time and date as soon as possible to have this important debate.